Stephanie Saintyl is a 17-year-old student entering her senior year at Immokalee High School. Stephanie is currently a member of her school’s SSTRIDE Program, a medical pipeline that works to prepare students for medical school. 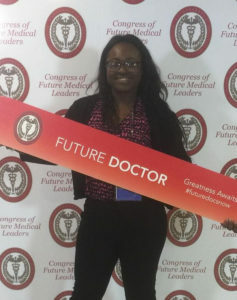 A few months ago, Stephanie was offered the opportunity to be the delegate for the State of Florida at the Congress of Future Medical Leaders held in Boston, Massachusetts. This is an annual conference put on by the National Academy of Future Physicians and Medical Scientists. The Congress of Future Medical Leaders is a nationwide conference and program for students interested in becoming doctors and scientists. With this wonderful opportunity came large costs in order to participate. To make her dreams a reality, Stephanie spoke with her SSTRIDE coordinator, Ms. Jodi, about the opportunity explaining her concerns regarding the expenses that are required. Thanks to the generosity of NCEF and Ms. Jodi, who found help from the NCEF, Stephanie received the funds she needed to attend the conference and represent her state in this once-in-a-lifetime experience. Stephanie learned a great deal from the inspirational talks by founder of the program, Richard Rossi, a Nobel Peace Prize winner and Harvard Medical School Professor. She also had the opportunity to meet Brendon Burchard, writer of “Activating the 10 Human Drives that Make You Feel Alive,” and speak with Carmen Blandin Tarleton, an inspirational woman who was one of the first recipients in the world to receive a full-face transplant. Overall, this entire experience was life changing, preparing her for her senior year of high school and taking the next steps to begin applying for colleges. Stephanie cannot wait to continue her education and achieve her dreams of a career in the medical field. A big thank you to NCEF and SSTRIDE for turning her dreams into a reality.